Thanks to Emily for this find. Amanda Siska at Bread and Badger makes freehand designs on etched glass. All her glass pieces are etched completely by hand. The designs are drawn or painted onto the glass, and then the design is carved out with a high-speed rotary tool and diamond burrs. This gives each piece a bit of personality and character. 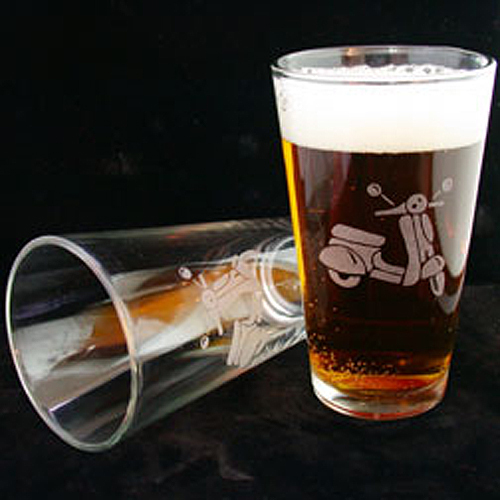 Her Scooter Pint Glasses are 16 oz and 5 3/4″ tall at $25 a pair. 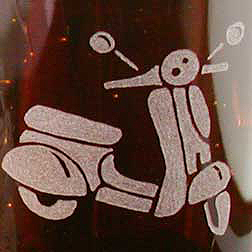 She also makes jewelry and vases and other glass ware and may be convinced to do this scooter design on those as well. This entry was posted in Ceramics, Pottery, Food, Wine by Tracy. Bookmark the permalink. I just saw their site (via pdx daily) and they have soap pumps with scooters as well. perfect for the shop if you fill your pump with Go-Jo!